I have been trying to distract myself this week. 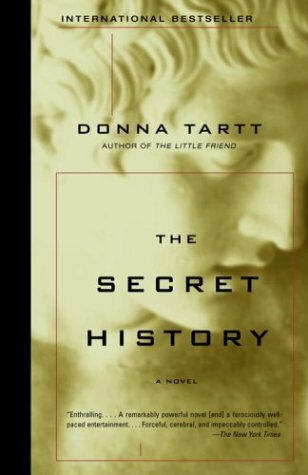 I managed to do a rather impressive job of it by perusing my to-read shelf and choosing The Secret History by Donna Tartt for no particular reason beyond the fact that it was on the top of the pile. I fell into this book hard and did not want to come out of it. Spent the better part of the last two days curled up reading, letting cups of tea go cold nearby. I’m not sure why I hadn’t read it before. I’ve been aware of it for years, I think I even flipped through it in a bookstore more than five years ago. I bought a copy a couple of months back and added it to the to-read shelf. Maybe it was waiting around for me to be able to give it my full and rapt attention. I loved it, really. For two main reasons. One: I’m a sucker for a good, interesting mystery that isn’t self-conscious about being mysterious. That likely makes no sense but just the idea of a murder mystery where you know the victim and the murderer from page one makes me happy, where the mystery is in the details and not the broad strokes of the crime. And two: I went to a small, New England college. Certain sequences and details reminded me very much of Smith. Even the weather was beautifully familiar. Memories of classes studying Greek theatre I’d all but forgotten brimmed to the surface of my oft-senile brain. In a way, it’s evocative of my own collegiate experience, but pushed to extremes and placed in a blender with a Greek tragedy. Whipped up on high volume to a frothy Bacchanalian frenzy. I can see how this can be a mixed-reaction book. I’m still not entirely sure I found the epilogue satisfying, but then I’m not entirely sure it was meant to be satisfying at all, really. It earned a spot on my tier of most favoritest books quicker than anything I’ve read in quite awhile, that’s for sure.